Despite a gloomy start to the day at Gravesend Railway Station, where we waited for our coach, this turned out to be one of the nicest, sunniest days we could have had at this time of year! Our trip to Norfolk was fairly uneventful – the unplanned detour around a housing estate near Ely being quite interesting really….. Julie kept our brains working with her Wildlife Quiz & chocolates. When we came to mark our papers there was some discussion about the correct answers, (the avocet’s beak does go down, then up Julie) but John & Stephen were the clear winners. At the visitor centre we were greeted by one of the wardens who told us what birds were about. We set off with determination, some to the cafeteria to buy tea (& cake, I suspect) & the rest of us to the first hide to see the birds. This is a large heated hide with immense glass windows for getting good views across the wet fields. 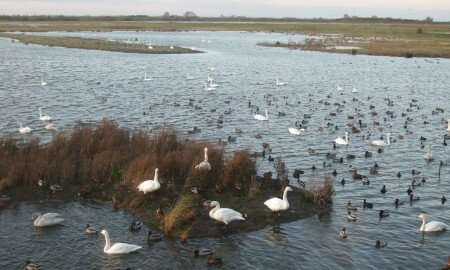 Many wigeon, mallards, teal & pochard all fed or loafed on the islands just in front of us. 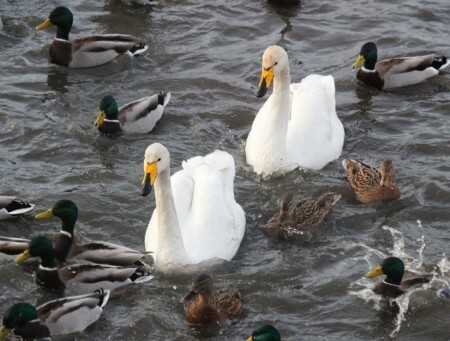 Whooper swans were also feeding close in. A large flock of Black-tailed Godwits came down nearby, & in the distance, flocks of Golden Plover swirled and twirled over the marshes. We visited the other hides throughout the day, spotting Bewick Swans, Barnacle Geese, Buzzards, Marsh Harriers, Peregrine and many people were lucky to see seven Cranes. The warden fed the birds outside the heated hide at 3.30. 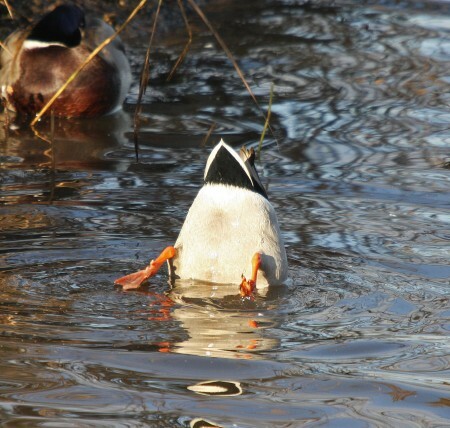 Our day came to a close to the sound of honking geese & swans & quacking ducks as they rushed to get the free food. Just as we prepared to leave the hide a Barn Owl was seen quartering the fields in the distance. A nice end to our day. Golden Plover, Black-tailed Godwit, Lapwing, Curlew, Redshank, Whooper swan, Bewick swan, Mute swan, Greylag geese, Canada Geese, Barnacle Geese, Coot, Moorhen, Pheasant, Mallard, Wigeon, Teal, Pintail, Shovelar, Pochard, Kestrel, Peregrine, Marsh harrier, Buzzard, Hen harrier, Grey heron, Cormorant, Jackdaw, Crow, Magpie, BH Gull, GBB Gull, Woodpigeon, Pied Wagtail, Goldcrest, Wren, Goldfinch, Barn Owl, Crane. Thanks to everyone who joined us for the day. Special thanks to Chris & Stephen for these photographs. Please remember to send photos for the competition.